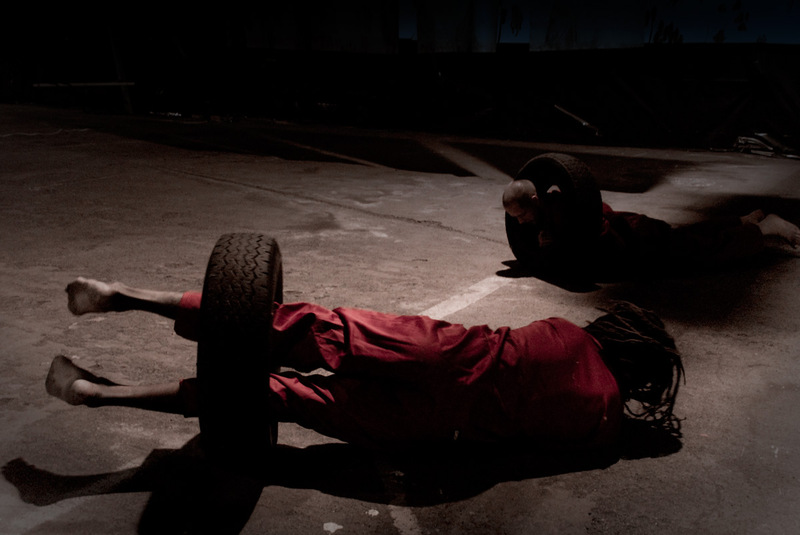 “For ‘Traffic’, Thom conceptualized a hard-hitting group performance, appropriating what is possibly one of the most infamous practices of community ‘justice’ and punishment from the mid 1980s-1990s in South African political history, namely ‘necklacing’. In short necklacing refers to the practice of filling a rubber tyre with gasoline, placing it around someones neck and setting it on fire. Necklacing in South Africa became a fairly commonplace practice during the turbulent 1980s when numerous traitors (informers for the erstwhile Apartheid government) and criminals were sentenced to death by informal community courts operating in the black townships. In 2008 during the South Africa once again saw a resurgence of the practice during the violenent protests against illegal Zimbabwean immigrants. Ironically, rubber tyres are also commonly used as toys by children – as homemade swings, for example. For a while now Thom has been appropriating iconographic images and objects associated with revolutionary practices and war – Molotov Cocktails, Ak47’s and even the shards of broken glass so often associated with violent public protests and riots. 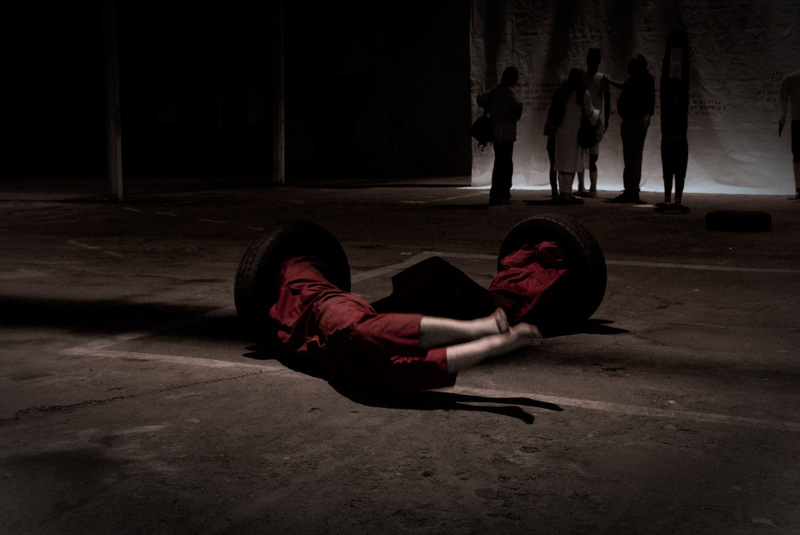 Now the rubber tyre makes its appearance and once again, it becomes an object that the artist ritually engages with over a prolonged period of time. At first one is drawn closer by the iconic nature of both image and action: four figures dressed in red workers uniforms (a nod in the direction of left wing political parties, or perhaps a reference to the infamous ‘red ants’ that vacate buildings occupied by illegal squatters in Johannesburg?) 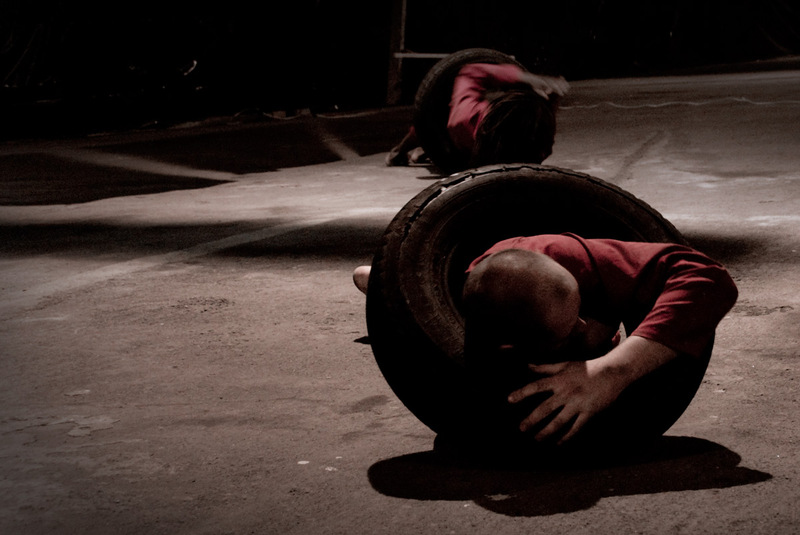 each with a tyre around their neck rolling around on the gallery floor. It is as if they are all battling personal demons, heading of into their own direction and struggling with the physical weight and form of the tyre around their neck. But then the elegant logic of the work is revealed: as the performers encounter obstacles along the way, including other performers, they simply change direction and continue rolling. Thus, in a movement that seems more aptly described as ‘the dance of death’ than an artwork, the performers continuously expand and retract into a single, chaotic whole. 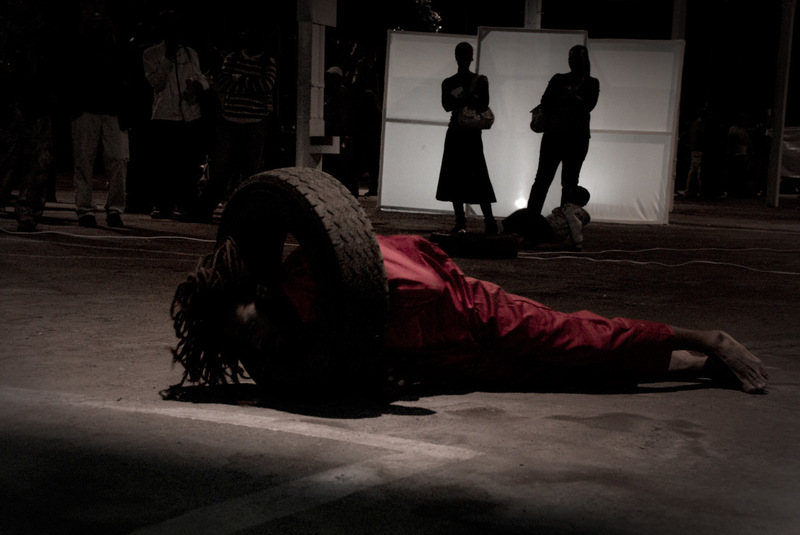 The work was produced as part of “Esikhaleni – Spatial Practices” curated by the Dead revolutionaries Club as a fringe even on the Johannesburg Art Fair 2008. Special thanks to the ‘About Art Program’ of the Fordsburg Artist Studios (Bag Factory) Johannesburg for sponsoring the production of the work.